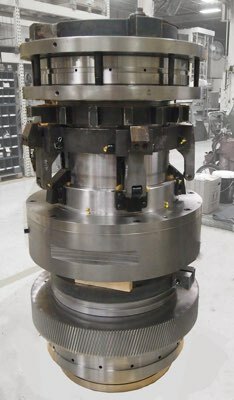 Today’s “Part in the Spotlight” is a Bardons & Oliver 316 Machine Spindle, created as a replacement part for a major manufacturer in the metals industry. This spindle weighs in the vicinity of 7,500 pounds (3,400 kilograms), stands 6 feet (1.83 meters) tall and is 38 inches (96.5 centimeters) in diameter. Take a look at our gallery page to see more parts we’ve machined for our clients.